Storms on Wednesday, 28 June 2017 killed 14 people in Madhya Pradesh. These incidents happened right after monsoon storms killed five in the state earlier this month. The 14 deaths occurred throughout a few different districts in the state. In the first incident, a group of five people died while they were returning from taking a bath in the Sakul River. The group consisted of a mother, her daughter, and three other female children. All five died on the spot. After initial reports of the incident, the Shapura police arrived on the scene. To the northeast in Tikamgarh, 5 more people died in two separate incidents. The first reported incident occurred in the northeast in Tikamgarh, 5 more people died in two separate incidents. The first reported incident occurred in Midaoli village during the ‘kanya bhoj’ event. Three men died in this incident while five others sustained injuries. Two women farmers died in Matoli village when lightning struck them during the afternoon hours. A mother and daughter died in Katni district when lightning struck their village. Police say the lightning injured four others during this incident. In Kotar, lightning killed a 14-year-old. The last death occurred in Dhanora town where a man died on the spot. The group of storms moved west across the state. 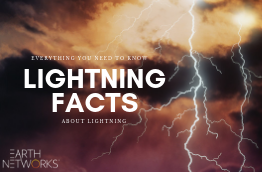 Our lightning detection system recorded 74,051 total lightning strikes. The video below shows the path of the lightning moving through Madhya Pradesh from 00:03 UTC to 23:45 UTC on 28 June. In the video above, we’ve marked off the areas where the majority of the fatalities occurred. 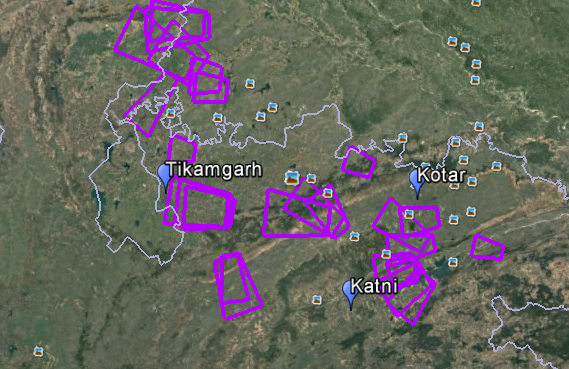 By watching the video you can see high frequencies of both in-cloud (purple) and cloud-to-ground (yellow) lightning strikes move through Madhya Pradesh. This system’s total lightning count of 74,000+ is just a little bit more than the storm that killed five earlier in the week at 70,000+. 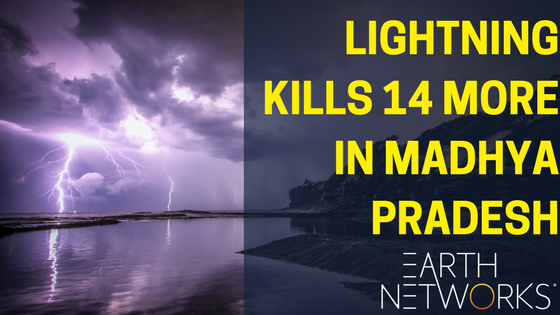 This high total lightning totals for such a small area are not uncommon in the state of Madhya Pradesh, or for the rest of India during monsoon season. In fact, lightning is a huge problem for the country of India. 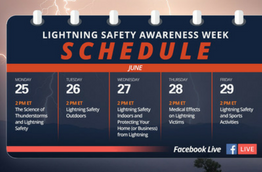 Some states began prioritizing lightning protecting before this year’s monsoon season. Severe weather killed over 1,600 people in India last year. Andhra Pradesh decided to add Earth Networks total lightning sensors throughout the state earlier this year. They deployed their new Earth Networks lightning network to decrease the amount of damage and death from lightning, cyclones, flooding, and other forms of severe weather. One of the most unique features of our lightning alert system: Dangerous Thunderstorm Alerts (DTAs). Dangerous Thunderstorm Alerts – DTAs for short – Are one of the most advanced early warning lighting systems on the market today. Our total lightning network generates the purple polygon alert when it detected high frequencies of lightning – especially in-cloud lightning. DTAs are a critical tool when it comes to saving lives and protecting infrastructure. On 28 June, our network generated 26 DTas in Madhya Pradesh. You can view them in the image below. As you can see from the photo above, the polygon alerts open to the area where the storm is headed. The path of the storm is obvious from the alerts in Katni and Tikamgarh especially. These types of alerts are critical for people in India to recieve during monsoon season, especially farmers and other outdoor workers.